Small American cities, like those in South Dakota, appear for the most part to be retaining their middle class, while the growing income inequality and gentrification are primarily happening in the nation's major metropolitan areas, according to a study done by the Brookings Institution. According to the study, South Dakota's small cities have a more even distribution of income than do major U.S. cities. Rapid City mirrors the national average most closely, though Sioux Falls and Sioux City also echo the pattern. All three cities have higher than average percentages of households in the second and third quintile (incomes between $21,433 and $65,952) while having a significantly smaller percentage of high-income households. Rapid City has 4 percent more than the national average of low-income households, while Sioux Falls has almost 5 percent fewer. In the United States, small cities (defined as those with populations less than 100,000) have a more even distribution of income than large cities and subsequently a larger middle class. Collectively, smaller cities mirror the national income distribution almost exactly. In large cities, however, both low-income (bottom 20 percent) and very high-income (top 5 percent) households are overrepresented. Data for this study was taken from the American Community Survey. Income distribution was defined by comparing city income data from 2013 to national data for the same year. Households in each city were classified by the quintile (fifth) of the national income distribution into which they fell. 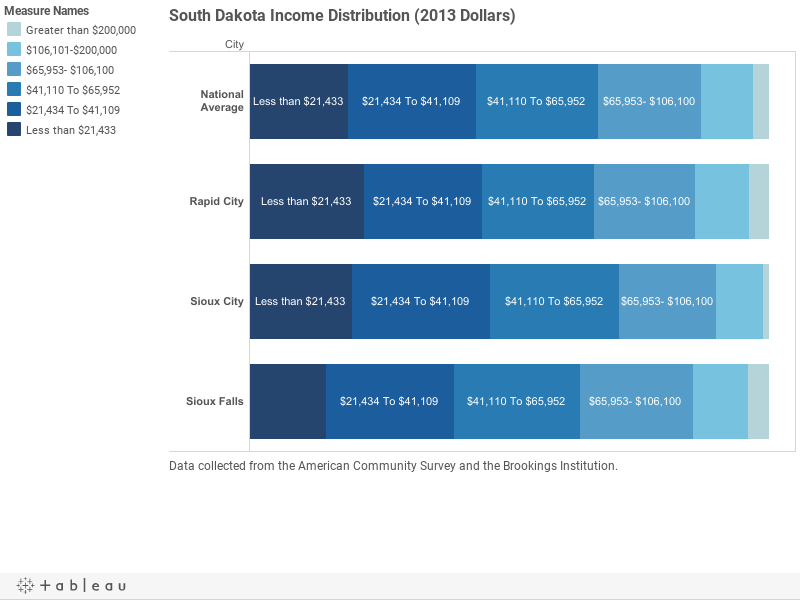 To compare South Dakota Metro Areas by income, see our median income charts on the South Dakota Dashboard.